First of all, a little self-indulgence. 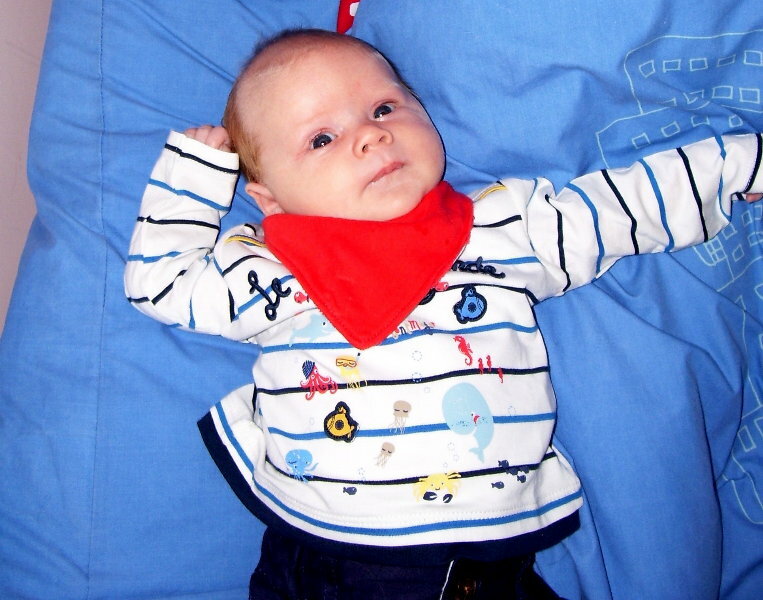 Here is a pic of grandson "Bill" Raffles (we call him). He has proper hair now, and is enormously more mobile ! I didn't take the pic, and to be honest I don't recognise him, so I'm just hoping it really is himself, he's changed so much ! So anyway, here's a property with scope for redevelopment, situated beside the picturesque Briare canal! The first night we stopped at Ouzouer-sur-Trezee, where I like to 'find' some lengths of dead bamboo, so useful as lightweight barge poles. Sadly the two I found were later blown off the roof in the storms at Moret-sur-Loing. I saw it take flight, and would've tried to recover it but the river was tearing past our mooring at a huge rate ! I feel pretty stupid about that, as I lost last year's from the roof during storms in Paris last year! Next time I'll pin it down properly ! Ouzouer has an extraordinarily tall church spire, itselve set atop a hill inside the old town wall, and it makes a dramatic outline. Well I didn't know there were red squirrels here, but I have proof. So pleased to catch this one. There was some precarious repair work going on in Chatillon-Coligny, this appendage was a safety net for bits and/or people falling from the webbing! Our preferred Hotel restaurant seems to have closed down, permanently (feel unreasonably guilty about that!) so we chose what turned out to be rather literally a high street cafe ! We enjoyed a good spell in Montargis, as we do like it there, but eventually we needed to move on. Not far tho', as we needed (yet more) plants and pots for the travelling season from the big Brico at the second, less pretty and commercial mooring area within barrow-wheeling distance from the Brico. It was there that we had a Polar Express moment, when a goods train moved in and later out of the adjacent railway line which we'd tended to dismiss as no longer in use, nor a danger. Gave us a nice porthole shot. So eventually we reached another favourite place, Moret-sur-Loing. 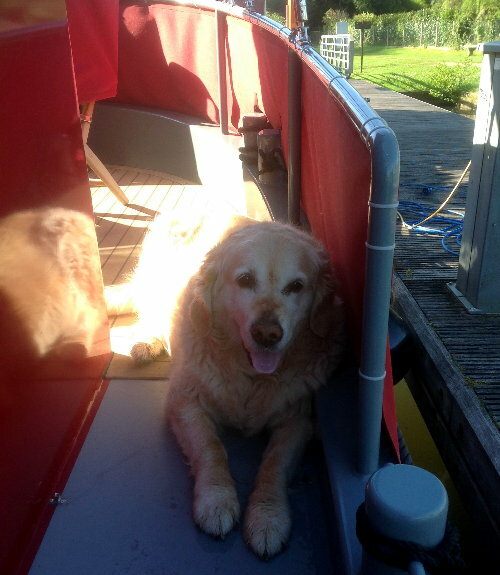 There was no mooring available, but luckily our friend Michael allowed us to moor alongside, so here is a picture of his faithful companion, Daisy, on board his barge, the same make as ours. In fact it was the first we saw the inside of. What a lovely dog she is, hard to follow. So just one more pic, of us on our mooring after Michael had moved on; in fact there were 4 of our make of boat there at one time, this pic just shows two of us. I'll show you the floods next entry, now that was fun, sort of!